Safely and effectively control the flow of CO2 to a single keg in your draft beer system with a product that's built to last while ensuring you never run out with this Micro Matic 642-2 double gauge regulator! This primary regulator from the rugged Premium series has a durable forged brass body with a chrome-plated finish and high-quality internal components that are sure to save you money on replacement costs and guarantee a constant pressure supply at even high-output flow rates. It features nickel-plated valve seats for excellent corrosion resistance and even includes an integrated sintered bronze mesh inlet filter to help control CO2 contaminants! 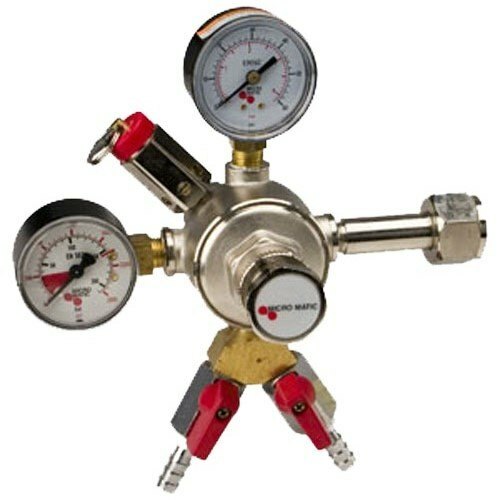 This regulator comes with an output gauge that has a 0-60 PSI range so you can quickly monitor the amount of CO2 flowing from your gas tank to both kegs, while the tank gauge has a 0-3000 PSI range so you always know how much pressure remains in your cylinder. Regulating CO2 is key in providing guests with quality draft beer because if the pressure's too low, your beer may taste flat and if it's too high, the beer may pour with excessive foam. The pressure on this regulator is easily adjusted by simply turning the ergonomic dial. It installs directly to your CO2 tanks and features a long-lasting nylon inlet seal to prevent leaks, while each of the 3/8" outlet includes a shut-off valve so you can quickly and easily stop gas flow. For added safety and peace of mind, this model has an integrated pressure relief valve that stops the gas flow if pressure gets too high (at 55-65 PSI).